Well, the time from prediction to near-fact is getting shorter. 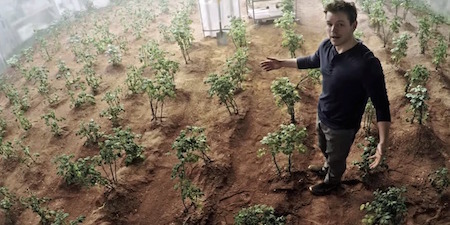 It turns out that NASA thinks that growing potatoes on Mars might be a cool idea - and so they are checking it out. All thanks to the book The Martian, by Andy Weir and the excellent movie. A team of world-class scientists will grow potatoes under Martian conditions in a bid to save millions of lives. The experiment, led by the International Potato Center (CIP) and NASA, is a major step towards building a controlled dome on Mars capable of farming the invaluable crop in order to demonstrate that potatoes can be grown in the most inhospitable environments.